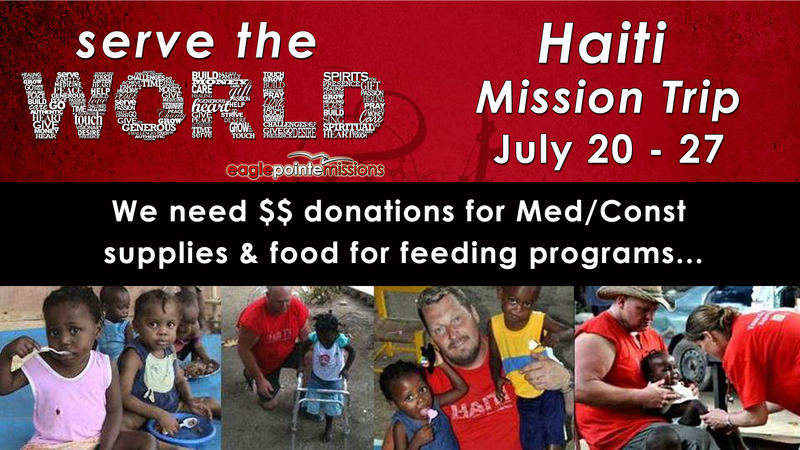 We will have a mission team heading back to Haiti July 20 – 27. We will run a free clinic for the week seeing 400+ families a day. We will also be providing medical care at 2 orphanages & tent cities that we work with. In addition, we will be doing some construction projects at a local church, as well as, building homes around the local community. And we need your help to pull this off! Below is a list of supplies needed for our Haiti mission trip. As well, there is also a list of the money for projects we need to fund-raise between now & then. PLEASE help us round up these supplies & donations. We need supplies dropped off at Eagle Pointe by Sunday July 13th – so we can pack everything up & have it ready to go. $2000 – medical supplies for free clinic we run while there. This entry was posted on June 4, 2014 by Howard J Koepka. It was filed under ministry .